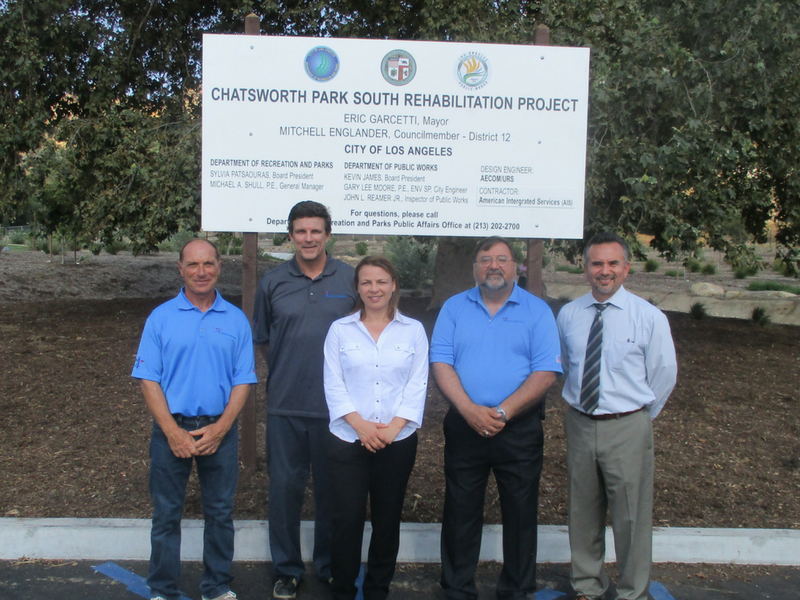 Chatsworth Park South Remediation and Rehabilitation - American Integrated Services, Inc.
AIS was under contract to remediate lead and PAH contamination and to redevelop Chatsworth Park South. The 72-acre park, located near the western edge of the San Fernando Valley, was closed in 2008 after environmental tests revealed lead and PAH contamination in the soil. Contaminants were from shotgun pellets and fragments of clay pigeons from a shooting range that once occupied the site. Previous environmental studies determined that remediation would be limited to 25 acres of the park property. AIS began by demolishing all existing hardscape and foundations, irrigation systems, fences and posts, curbs and gutters, and a 4-inch-thick asphalt maintenance road. Storm drain lines were cut and abandoned. Asbestos containing transite piping was properly removed. AIS grubbed the upper 12” of the existing terrain within 23 acres of the project area to remove tree stumps, while protecting designated Tree Protection Zones. AIS then rough graded the existing native terrain, laid geogrid, and placed 2” of crushed rock and 10” of clean soil (35,000 CY) to cap the entire area of concern. Four detention basins with interconnecting bio-swales were constructed, along with multiple storm drain and drainage structures. Lead pellets and surficial soil were removed within the upper 3” of existing terrain from the remaining 2 acres that are located outside the overall project area, within a rocky outcrop area, by vacuuming and handpicking in order to reduce exposure concerns. Landscaping tasks included procurement and planting of 335 native trees in mounded and at-grade groves. AIS installed a new irrigation system, and hydro seeded the rocky outcrop area and various turf areas. ​Other site improvements for the park included construction of a combination of chain link and Omega fencing along the perimeter of the park, equestrian fencing along a horse trail, an improved decomposed granite hiking trail, new concrete walk ways, and installation of a wood deck bridge. AIS also installed new drinking fountains and water lines. Contact AIS if you have a site that requires remediation, construction, demolition, transportation or emergency response. We've been the environmental service leader in California since 1998.